After the tarpaulin had been blown partly off the workshop roof a gang of us went to the woods and pulled it back in place and fixed the broken rafter rather than totally pack up the workshop for the winter. We’ll see if it survives until spring. Springtime in the woods can be fabulous with energy abounding all around but winter is often best spent in a cosy house in front of a glowing log fire. Yesterday (with my wife’s permission) I brought my shaving horse into the house and spent three hours carving a spoon for my eldest daughter, using a branch cut from a cherry tree in the orchard where she spent the summer working. 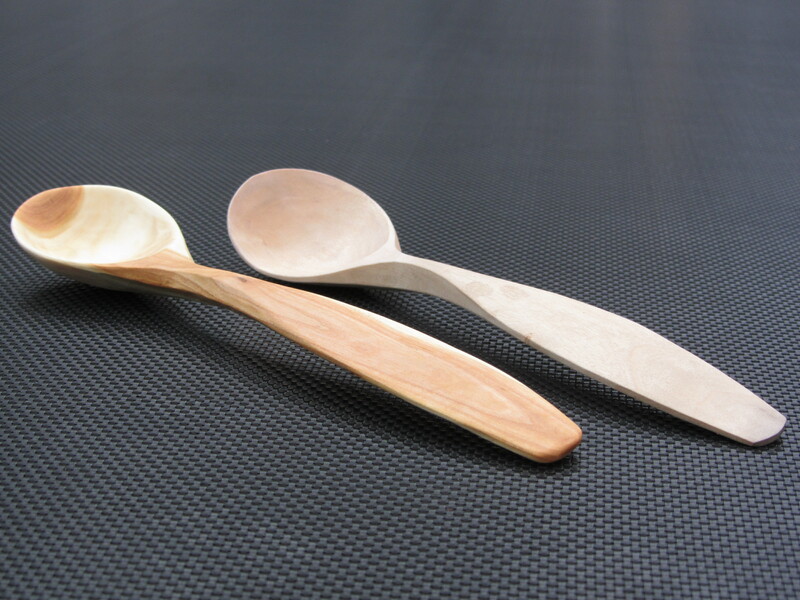 I flagrantly copied a beautiful spoon made by Barn-the-spoon, who was my assistant a few years ago and is now a full time spoon maker. It took me about 10 times longer to make and it still hasn’t got the elegance of his but it was still a delightful way to spend an afternoon.